Giovanni and Gentile Bellini, Tintoretto, Tiziano, Paolo Veronese, Cima da Conegliano, Taddeo Zuccari, Vittore Carpaccio, Giorgione, Lorenzo Lotto…the quantity – and quality – of artists working in Venice during the Renaissance is impressive. Patrons were plenty, but so was the competition, and this led to a number of exceptional works, frescoes an canvases decorating churches and palaces that still delight visitors today. Below are five artists from Veneto you should be familiar with before you visit Venice. The Bellini brothers, Giovanni and Gentile, were born into an important family of artists. Their father, Jacopo, was one of the founders of the Renaissance style of painting in Venice and northern Italy and influenced the early works of his sons. Andrea Mantegna, court artist to the Gonzaga, was Giovanni’s and Gentile’s brother in law. Born in Venice in 1430, Giovanni himself became one of the most influential Venetian artists. He lived and worked in Venice all his life during a career that spanned 65 years. He is especially known for his pioneering use of oil paints to convey light and color, his creative altarpieces and portraits, and attention to landscape detail. Gentile, the elder brother of Giovanni, born in 1429, ran the Bellini family workshop and was the official portrait artist for the Doges of Venice (see the portrait of Doge Giovanni Mocenigo in the Museo Correr). His earliest signed work is The Blessed Lorenzo Giustinian (1445), one of the oldest surviving oil paintings in Venice, on view at the Accademia Museum. Unfortunately, Gentile's most important paintings, the monumental canvases in the Doge’s Palace, were destroyed by fire in 1577. 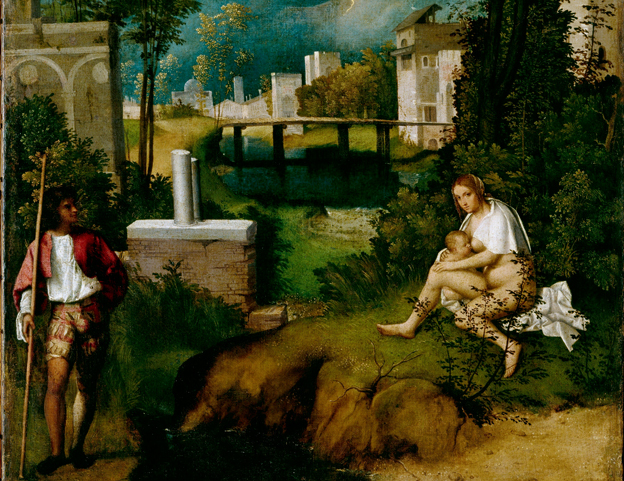 Born in Castelfranco Veneto in 1478, Giorgione is surrounded by an aura of mystery as little is known of his life, which was cut short at the young age of 30. He was a pupil of Giovanni Bellini and, along with Titian, he founded the Venetian school of Italian Renaissance painting, which favored color over line (as opposed to the Florentine school of painting), and which contrasted with the Mannerism then prevalent in the rest of Italy. A painting he made for the Doge's Palace was destroyed and only fragments remain in the Ca’ D’Oro of frescoes he painted for the exterior of the Fondaco dei Tedeschi, the German merchants' warehouse. Born in Pieve di Cadore near Belluno in 1490, Titian (Tiziano) was the most important member of the 16th-century Venetian school, and the most versatile artist, equally at ease with portraits, landscape backgrounds, mythological and religious subjects. Especially known for his use of color, Titian would largely influence both painters of the Italian Renaissance and future generations of Western artists. Titian trained under Giovanni Bellini and Giorgione. 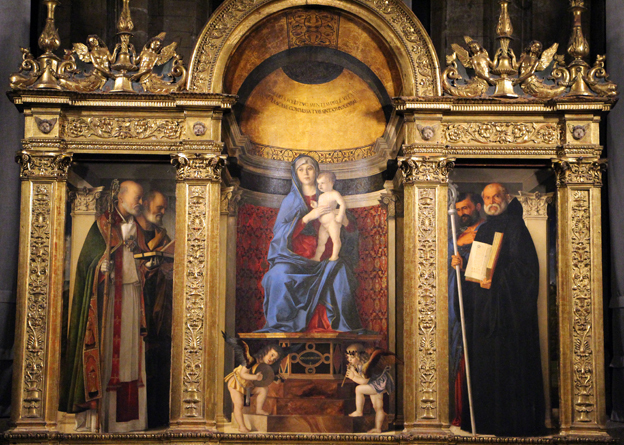 His first major public commission in Venice, the Assumption of the Virgin for the high altar of the Basilica of Santa Maria Gloriosa dei Frari (1516–18), at nearly seven meters high, the largest altarpiece in the city, soon established him as the leading painter in Venice. Several paintings in the Church of Santa Maria della Salute, including St. Mark Enthroned with Saints Cosmas, Damian, Sebastian and Roch, the altarpiece of the sacristy; ceiling paintings of David and Goliath, Abraham and Isaac, Cain and Abel. Tintoretto, born Jacopo Comin in Venice in 1518, was another major figure of the Venetian Renaissance His work is characterized by its muscular figures, dramatic gestures, and bold use of perspective in the Mannerist style, while maintaining color and light typical of the Venetian School. 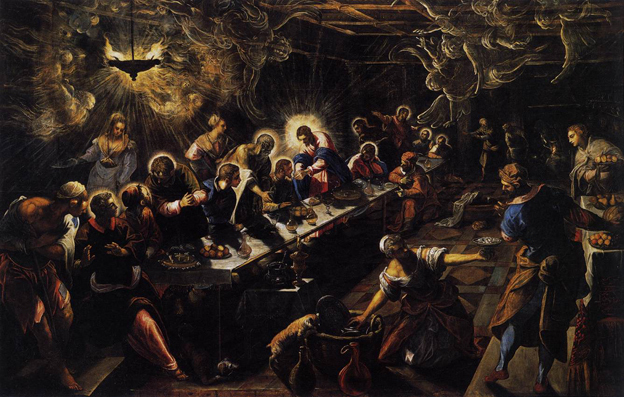 Tintoretto lived and worked most of his life in Venice and was deeply influenced by Titian. 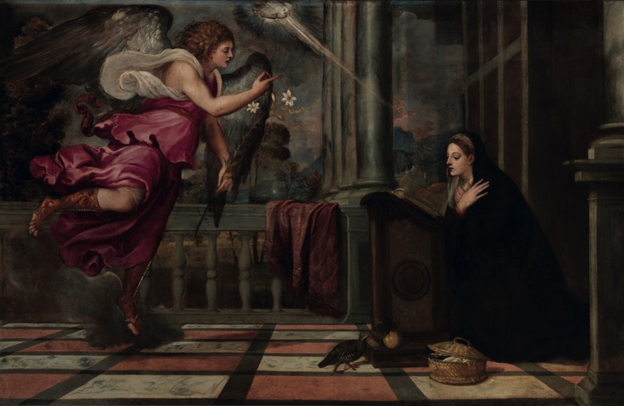 After Titian’s death, Tintoretto became, along with Veronese (see below), one of the leading painters in the city, in charge of a large workshop. He was hired for a number of commissions for the Doge's Palace, and for an exceptional cycle of paintings for the Scuola di San Rocco. Along with Titian and Tintoretto, Paolo Veronese, born in Verona in 1528, forms the trio that ruled over Venetian painting in the 16th century. He is especially known for large-format history paintings on religious and mythological subjects with theatrical effects. He was influenced by Titian in his approach to composition, narrative, and coloring, but he is more classical and harmonious than both Titian and Tintoretto, placing him close to Mannerism.